To build the right jobs at the right time you need the ability to schedule and sequence all the activities in you work center to meet targeted delivery dates. Made2Manage ERP seamlessly integrates enterprise resource planning and scheduling with shop floor execution to help you achieve greater visibility, increased agility, and optimal efficiency. Let's take a closer look at the advanced scheduling capabilities to manage can help you minimize late jobs and maximize throughput. 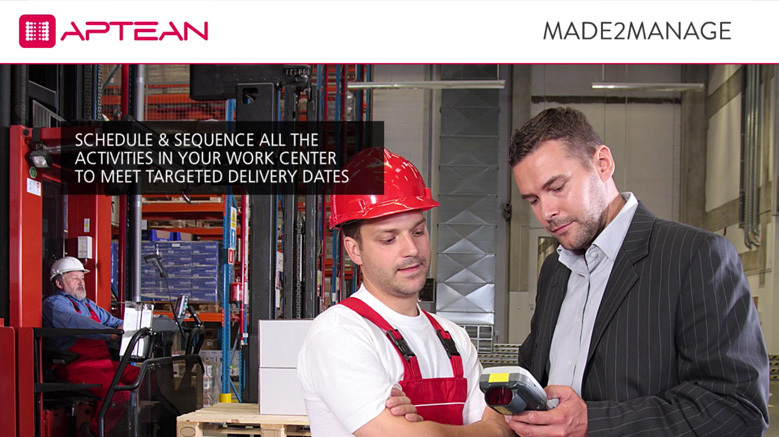 Built for made to order, made to stock, and mix more manufactures, Made2Manage ERP features planning and advance scheduling capabilities that enable you to prioritize, sequence, and schedule jobs operations in real time or in what if mode to give planner tremendous flexibility. Once the plan is executed, the system draws up to the minute formation from the Made2Manage ERP back office to provide deep visibility and facilitate highly accurate scheduling. When generating a schedule, the user has access to state of the art algorithms previously available only to the largest and most advance manufactures. This enables you to generate schedules for specific needs and goals. Planners also have the ability to prioritize runs based on demand types. The powerful engine immediately executes a schedule that dictates which jobs will run in what order in the appropriate work setters. The system also alters you to do any jobs that will not be completed on time. When problems arise Made2Manage ERP provides a scheduling audit that allows you to review newly orders as well as orders that have been pushed back drill down to see what components are required and checked material availability. With information at your finger tips it's easy to view jobs based on a verities of criteria such number of days late or early and take immediate action to resolve any exceptions. In this scenario your focus on the expiations viewed points to bring issues to attention with just a few clicks you can drill down directly to the job order to viewed both operations, and materials information. The advance scheduling capabilities in Made2Manage ERP also provide a drag and drop Gantt chart format that makes it simple to view and edit schedules in graphical format. For answers in an instant, wide functionality allows you to drill into a job to see what is causing the delay and access the Gantt chart tool to adjust tasks to alternate machines or work centers. In addition, to quickly identifying work center issues the solutions wide functionality can also pin point problems with component ability. This allows the planner to make realistic decisions based on dose materials constraints. Made2Manage ERP enables you to easily make adjustments such as billing in overtime and adjusting crew sizes with just a few clicks. Information generated by advance scheduling can be reported by printing work center dispatch list or it can simply be viewed by operators with the shop floor terminals. Advanced scheduling in Made2Manage ERP gives you the power to create and manage sophisticated plans with ease, helping you shop floor run at maximum efficiency, while still quickly adapt to customer demands. Only Made2Manage ERP enables you to plan more effectively, schedule with confidence, execute changes swiftly, and see your operations details right down to the shop floor. To learn more about Made2Manage ERP, please contact DKM today.